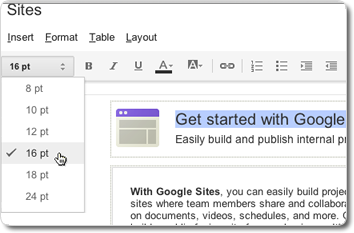 With Google Sites, you and your team can easily build and publish internal web sites. Use a WYSIWYG editor or work directly with HTML. You can even embed Google calendars and other gadgets on your site! With Google Sites, teams can build sites to share and collaborate on documents, videos, schedules, and more. Or build a public-facing site for your business. Building a basic site is as easy as editing a document!